Antigua so far has been a town of hello and goodbyes for me. Am back to travelling solo, as the girls flew out the other morning. Since then I have been adjusting. Am getting used to having no plan but my own and it being Antigua, drinking lots of great coffee! I had heard many great things about Antigua from other travellers, so I had high expectations arriving here, and was not disappointed. A bright, friendly place where travellers seem to lose time and stay around for longer than originally intended under the pretext of learning spanish. It’s easy to see why. Antigua was listed as a UNESCO World Heritage Site in 1979. Local conservation laws are very strict for example, businesses are pressured to paint their premises in officially sanctioned colours. So yes, lots of photographs have been taken. Earthquakes, religion and wealth have shaped this colonial city, which was believed to be at it peak in the middle of the 18th C. Following an earthquake in 1717 there was an unprecedented building boom, and the population rose to around fifty thousand, but another earthquake in 1773 brought all of it to an abrupt end. The damage was so bad that the decision was made to abandon the city in favour of the modern capital. However there were many who refused to leave and Antigua was never completely deserted and over time the city has gradually been repopulated. If you are somebody who likes to walk around a town to discover it, then this is the place. 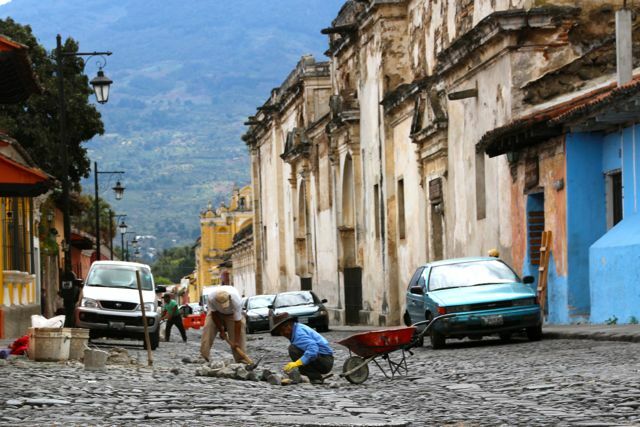 Antigua has an incredible number of ruined and restored colonial buildings that provide an idea of its former status. Somebody mentioned there are upwards of 58 churches, if that takes your fancy, I didn’t test their theory but have sent many hours rambling around taking it all in. What I forgot to mention is geography. Antiqua is nestled between a number of striking volcanos. Namely Agua, Acatenango and Fuego volcanoes, so next up are some hikes to work off all the coffee and cakes! Streetside snacks…. chili on your mango? Great reading the story, and history of the buildings bright colors. Was an interesting place to visit. I am a sucker for brightly coloured buildings ! It seems a small town but lot of great and colorful scenes. Hi! Yes, quite a vibrant town, many interesting buildings and lots of colour. Are you considering going there?